It was so cold the other day so I cooked something that has soup in it, I made tinolang manok. My husband ask me something interesting when I was making it. He asked why I have to add a fish sauce on a chicken meat. Bakit nga ba? I think it add a unique flavor to the sabaw (soup) rather than using a salt. What do you think? 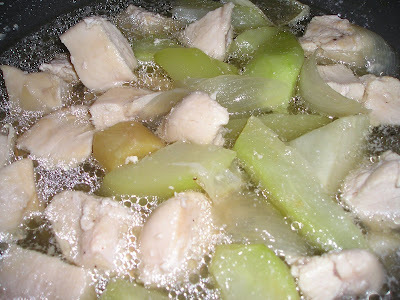 Do you add fish sauce in making tinola? But anyhow, this Filipino dish is very easy to prepare. All you need is chicken meat (I prefer chicken breast), papaya or sayote squash, ginger, pepper and pepper leaves (spinach is a great alternatives too), fish sauce, garlic, onion, chicken broth or water and black pepper to taste. To prepare, you need to saute the garlic, onion, chicken meat and the papaya then add fish sauce and water/chicken stock. Bring to a boil and when the meat is tender put the spinach and pepper and tadah you have a yummy tinola.... Try it , its goodah!